Live from HeroesCon 2013, it’s Atomic Robo Nuts & Bolts! That’s right – Brian, Scott, and Cap hosted an episode of Nuts and Bolts in front of a live crowd in Charlotte, NC for the first time. In this episode we discuss Dr. Dinosaur and his first two Free Comic Book Day appearances in 2009 and 2011. Why, you ask? 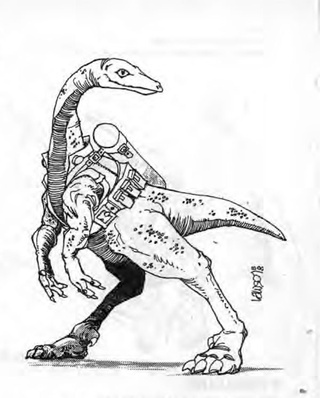 That kooky lizard is getting some of the spotlight in Volume 8 of Atomic Robo: The Savage Sword of Dr. Dinosaur! …So we figured a primer was in order. This is a momentous occasion! It’s the first time all three hosts have been in the same place together and we get to answer fans’ questions LIVE. (This also explains why it sounds like were in a gymnasium, there was a lot of slap-back in that tiny room.) Embark on a voyage into the strange! Including: Brian’s reoccurring time travel death dreams, the humor of cats, the Atomic Robo movie that never was, Jenkins history revealed, and of course… a terrifying look into the mind of Dr. Dinosaur. 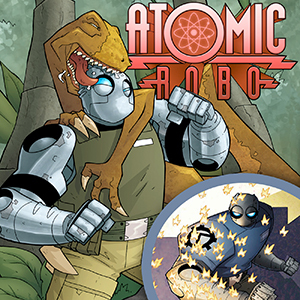 Read Atomic Robo Volume 8: The Savage Sword of Dr. Dinosaur! Read Atomic Robo: Real Science Adventures digitally! Buy other Atomic Robo volumes digitally!